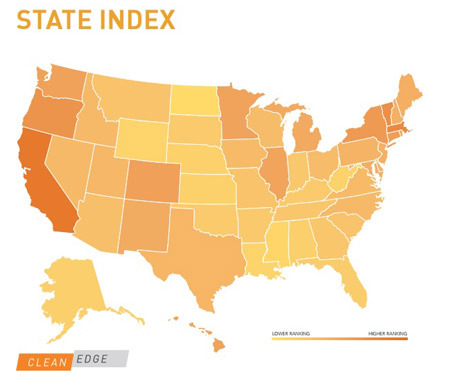 New Hampshire ranked 18th in this year's U.S. Clean Tech Leadership Index, “which is a pretty strong showing for any state,” according to Andrew Rector, market analyst for Clean Edge – the West Coast-based research and advisory firm that releases the annual index – but it's the lowest ranking the state has had since the index started in 2010. New Hampshire has placed as low as 17 and as high as 11, fluctuating some, but in recent years the state has dropped six places to its current standing. That may be due to the state falling to the middle of the pack in a number of indicators, said Rector. This year, Clean Edge added a clean energy jobs indicator with information from the Department of Labor. Based on the number of clean tech jobs as a percentage of the state workforce, New Hampshire ranked 16th. “Which isn't bad, but there are some states that got boosted above New Hampshire for having that particular metric,” said Rector. And New Hampshire ranked 24th for tech leadership, unchanged from last year. But the state dropped drastically in terms of capital investments, dropping from 11th place to 22nd, due to no measured venture capital deals for the clean tech sector in 2016, said Rector. Rector admits that Massachusetts and California steal most of the thunder in the clean tech space, ranking in the top two spots and capturing about two-thirds of capital venture investment. The good news is New Hampshire is doing well in terms of energy policy, electricity productivity and electric car adoption. The Granite State improved two spots in the policy indicator, ranking 13th in the nation. Rector did not name one policy, but said generally high-ranking states provide incentives for community solar, on-bill financing, clean tech vehicle purchasing incentives and energy efficiency grants, loans and bonds. Based on 2015 data, New Hampshire ranked 9th in electricity productivity, calculated by measuring GDP productivity against electricity usage. New Hampshire also ranks 8th in terms of hybrid vehicles per a million people, 9th in terms of plug-in hybrids and 12th for electric vehicle stations.